Serving the entire Richmond area including Barton Heights, Battery Park, Broad Rock, Capital Square, Chestnut Hill, Commonwealth, Jackson Ward, Laburnum Court, Oregon Hill, Springhill, Union Hill, Woodland Heights, and all the neighborhoods and suburbs in and around Richmond, Virginia. Free Consultation & Design Estimates in and around Richmond, VA call 1-888-507-7960. Celebrity Greens Richmond is the Authorized Celebrity Greens Dealer of Artificial Grass Putting Greens, Artificial Turf and Sports Fields in the Richmond, Virginia area. We design and install USA-Manufactured, premium quality, and environmentally friendly artificial putting greens, lawns and sports surfaces! Our eco-friendly artificial grass is completely lead-free and comes with tremendous environmental benefits including requiring no mowing or fertilizing. Our artificial grass installations will save the average home owners thousands of water each year. We can install highly athletic sports surfaces, as well as padded playground surfaces to help reduce injury and making playing more fun and ball response more consistent. 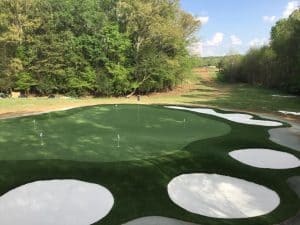 We specialize in planning, designing and installing advanced sand filled, synthetic grass golf greens that look incredible and play like those on the PGA tour. Our artificial putting greens can even be installed indoors, allowing you to practice your putting year round. We also offer many custom design features including sand traps, water hazards, lighting and other amenities to enhance your landscape and improve your short game. Contact us today and we’ll work with you on designing the perfect artificial grass lawn, playground, sports surface or your own signature putting green. If you’re dreaming of installing a gorgeous synthetic turf putting green in your backyard, or you need a great artificial grass side yard for the dogs, call us today. Our highly trained team of designers and installers, can come out and give you a free quote. Celebrity Greens Richmond offers complete artificial grass design and installation services, and we’re proud to offer eco-friendly products that require very low-maintenance while remaining lush and green through every season and all weather conditions. Contact us today at 1-888-507-7960 for a FREE Artificial Grass consultation!